Browse the full Image, Species, BLog, Aquaria, Wishlist, Spotter or My Cats updates! This month's featured species is Chaetostoma aff. lineopunctatum. Are you looking for in-depth on a particular species? Then check out the vast CotM Archives. 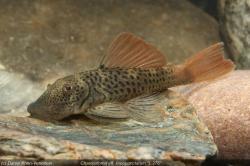 Need accurate info and images of a particular catfish species? We have 4,451 species, 17,296 images encompassing 47,936 populations in 5,695 registered aquaria. See also the catfish on stamps, habitat, underwater, video collections and all C, CW, L & LDA numbers. Catfish & fishkeeping book reviews written by aquarists for aquarists. Includes details on where you can buy them online. Featuring the relaxing Touch Pools and the Fantasy Catfish page. Buy unique merchandise from our online store. Pages about the webmaster, site map, credits, reviews, trophies and the catfish links page. Subscribe to our Announcement Forum. Learn about how YOU can contribute to the continual improvement of your favourite catfish site.